The breviary gives hymns, prayers and readings, along with instructions, for the prayer services called the 'divine office' which were said several times each day. This page has services for the beginning of the 5th Sunday after Easter (Rogation Sunday). 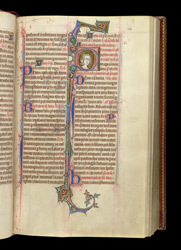 The Bible readings begin with John 16:23, and the title identifying the day begins with a historiated initial with a portrait of St John the Evangelist, recognisable by his red robe and youthful appearance.